It's one of the tightest Christmas weekends in recent memory, with as many as six different films having a chance to take the top spot on the weekend, and not all of those being among the weekend's slate of new offerings. I don't know about you, but six new wide releases on Christmas Day just isn't quite enough. In theory, I could only spend half the day watching all the new films out that day, if I for some reason hated myself. I look forward to the day when I can spend a whole 24 hours watching the new releases of the day, if I could rope some poor theater operator into staying open. Of course, the idea is that you go back multiple times during the week, and it'd be a shame to have a demographic not satisfied. 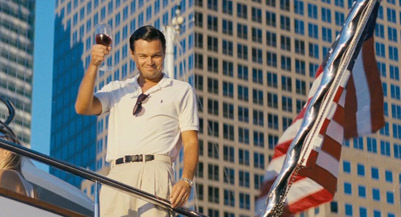 A strong contender to lead the way for the new films is The Wolf of Wall Street. After the faux-Scorsese of American Hustle, here comes the real stuff. Scorsese's new muse Leonado DiCaprio stars as infamous Wall Street scammer Jordan Belfort, who found a way to milk the system in the 1980s, taking millions in pump and dump schemes before finally being caught. The film spans his rise and fall, his excesses and scams, and how he fit right into the emerging corporate greed culture at that time. The film also stars Jonah Hill as his brash confidant, and Kyle Chandler as a federal investigator hot on his tail and openly challenging his legitimacy. In this sense it resembles a corporate version of Goodfellas with a dash of Catch Me If You Can.